Vinyl siding has been around for a while. In the late 1950s it became a popular option to aluminum siding. It began to take off in the 1970s when manufacturing improvements resulted in a stronger product with virtually unlimited color options. Just like not all cedar shingles are of equal quality, not all vinyl siding is the same. It is important to understand the manufacturing process used by the manufacturer so you know that you are getting only the very best. We are proud to offer Gentek, Royal and Mitten siding, and believe they deliver the best products on the market. Vinyl siding is often not recommended for areas with extreme weather conditions. Some of our siding is rated for hurricane-level winds up to 253 miles per hour. We’ve also got the largest selection of vinyl siding colors you’ll find anywhere. Vinyl is a great choice for almost any application, but like anything else there are pros and cons. Here’s a list that the Golden West Exteriors team has put together, based on their experience with vinyl siding. Quick Installation — Vinyl siding is inexpensive to install and goes up really fast. Make sure though, that whoever is installing your vinyl siding is experienced. Properly installed vinyl siding expands and contracts with changes in the climate, allows air to circulate to keep mold and moisture away, and provides excellent protection for your home. Improperly installed vinyl may crack and split when the weather gets cold. It may also trap moisture, creating a breeding ground for mold and fungus. Versatility — This is not your father’s vinyl siding. Modern siding comes in an almost unlimited choice of styles, sizes, and trims. You can get the look of cedar shake or other expensive wood siding for a fraction of the cost. No Painting — You don’t have to paint siding. Color will fade slightly but it will last much longer than painted siding. Low Maintenance — Simply clean your siding periodically with a garden hose. If your siding is really dirty, a weak vinegar solution or a mild detergent can be sprayed on and rinsed. You don’t have to worry about pressure washing. As a matter of fact, most vinyl manufacturers advise against pressure washing. Easy Repair — If you need to replace a vinyl shingle or panel, they are easy to remove and replace without impacting the surrounding siding. The biggest challenge might be matching a color that has faded slightly. A good trick is to make your repair with a piece of siding from another part of the house that isn’t very visible. The Environment — Vinyl is made of polyvinyl chloride (PVC). The manufacturing process creates greenhouse gases. And in the case of a house fire, toxins from burning vinyl pose a hazard to homeowners and firefighters. Vinyl is also not typically recycled. The process is costly and difficult. Estimates are that less than 1 percent of vinyl siding gets recycled. Quality Variations — You have to know what you are buying. Products made with the most up-to-date manufacturing processes will last 50 years. Others may begin to fade within 15 years. 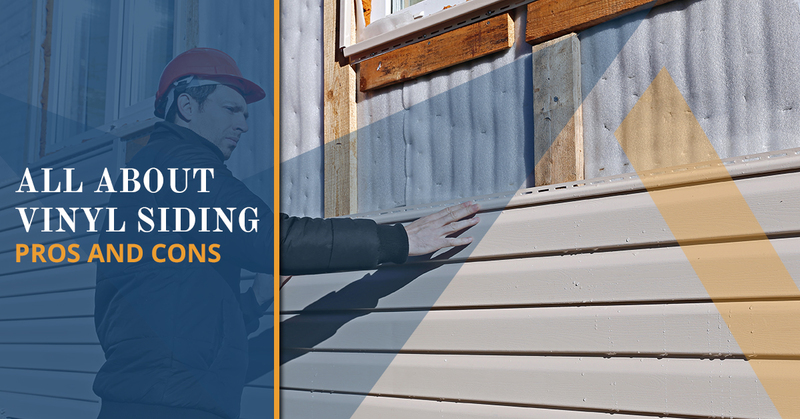 Insulation — Unless your vinyl siding comes with rigid foam insulation, you’ll need to find another way to insulate your home and maintain its energy efficiency. Vinyl Siding, Yes or No? We like vinyl siding, or we wouldn’t offer it to our customers. If you aren’t sure if vinyl is the right choice for you, give us a call and we’ll come out for an on-site consultation. You can look at samples of vinyl and other siding options, and we’ll discuss the pros and cons for your particular installation. We look forward to hearing from you!